Winfield Henry Co. Ia. 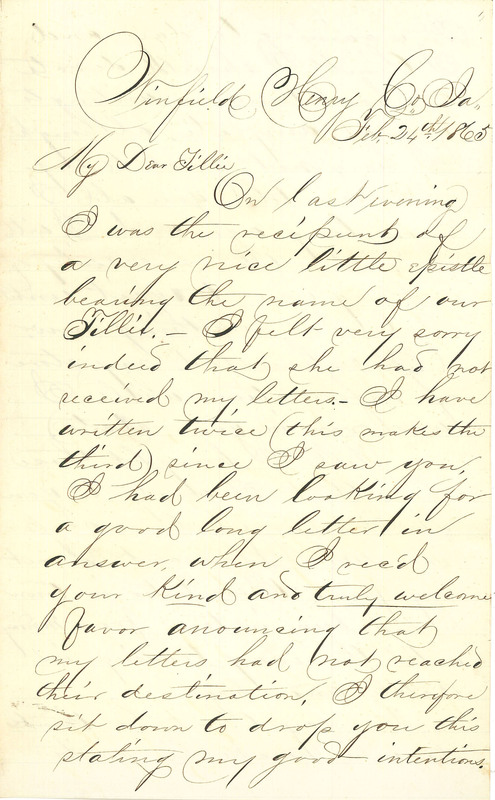 Feb 24th 1865 My dear Tillie, On last evening I was the recipient of a very nice little epistle bearing the name of our Tillie. I felt very sorry indeed that she had not received my letters. I have written twice (this makes the third) since I saw you. I had been looking for a good long letter in answer, when I rec&#039;d your kind and truly welcome favor anouncing that my letters had not reached their destination. I therefore sit down to drop you this stating my good intentions. Winfield Henry Co. Ia. Feb 24th 1865 My dear Tillie, On last evening I was the recipient of a very nice little epistle bearing the name of our Tillie. I felt very sorry indeed that she had not received my letters. I have written twice (this makes the third) since I saw you. I had been looking for a good long letter in answer, when I rec'd your kind and truly welcome favor anouncing that my letters had not reached their destination. I therefore sit down to drop you this stating my good intentions.